This line of poetry reflects my own view that you never stop learning however ‘expert’ others perceive you to be. Indeed, in my botanical and mycological world, the more you learn about a subject, the more you come across others who know far more than you, and then you learn that there is more to learn than you ever dreamed before. But getting started is the hardest learning process I think. It’s especially hard when you’re starting a career in something you’re emotionally or intellectually drawn towards. How do you get the chance to prove yourself? Where should you go? Who can help you? How can you afford to get training? 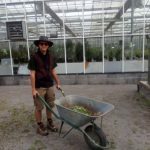 I’ve been working in the Garden for quite a long time now and I’ve really enjoyed seeing the development of the horticultural apprenticeship scheme over the past 4 years. It’s something the Garden, and its main apprentice supporter Patrick Daniell, should feel proud about. 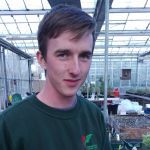 To take on someone who has a passion for horticulture but little experience is quite an undertaking given that many of our horticulturists have had to spend years training for qualifications. But the scheme is really starting to bear fruit now. 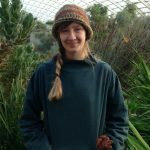 Our first apprentice, Carly Green, has graduated to being in charge of our Welsh native plant collection and I can personally testify that she has taken this on with a whirlwind of enthusiasm and ambition, qualities that I expect she feels safe to do in a place where she learnt her trade. Two other apprentices, Matthew Bryant and Ben Wilde, spent part of last year helping me to collect wild orchid seed from our Waun Las meadows and I loved seeing how they both seemed at ease with botanical nomenclature and had an instinct about what to look for. A couple of weeks ago, I found myself sat next to our latest apprentice Jen Keyte at a seminar about sustainable food and was impressed how much she knew about the issues and how she clearly wanted to find out more, a great quality in an apprentice. I’ve also thought that I’ve never seen a hatless Jen since she started with us in the autumn – it’s not stopped raining since she joined us! If you’re interested in becoming an apprentice, our next round of recruitment has started. You’ll find details of how to apply beneath this blog.